10th Anniversary of the one and only HUNGER! One cover of $15 gets you into all 9 venues: Black Pirates Pub, Crock’s, The Foundry, The Sovereign Room, Gargoyle’s, A Little To The Left, Red Lion Smokehouse, The Body Barre and *HELL. Thousands in Halloween Best Costume Prizes-[all locations/venues]! Pick your story, diabolic or devilicious. Move between bars and interact with every soul along the way, you could even win prizes in the street. 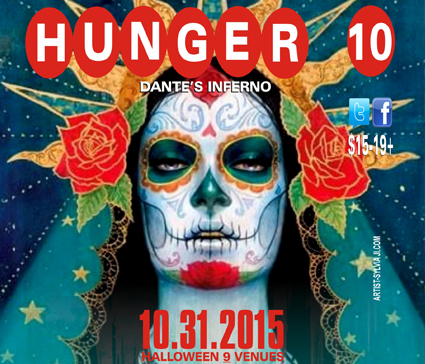 Feed your hunger and treat yourself to the largest, wildest, slickest HALLOWEEN experience x 9…. Receive a Multi-Pass/Wristband the night of the event with full schedule of acts, choose what you want to see and hear…You’ll Remember Halloween! 4,350 attended last year! ~ Advice: come early, you don’t want to miss a thing! 19+/ID required. >Multiple DJ DANCE PARTY’s at 5 Bar Venues-and ILLUMINATE lighting end of times extravaganza at the HELL venue! >Hunger photographers takin’ snaps all night!… ASCENSION -more to come!